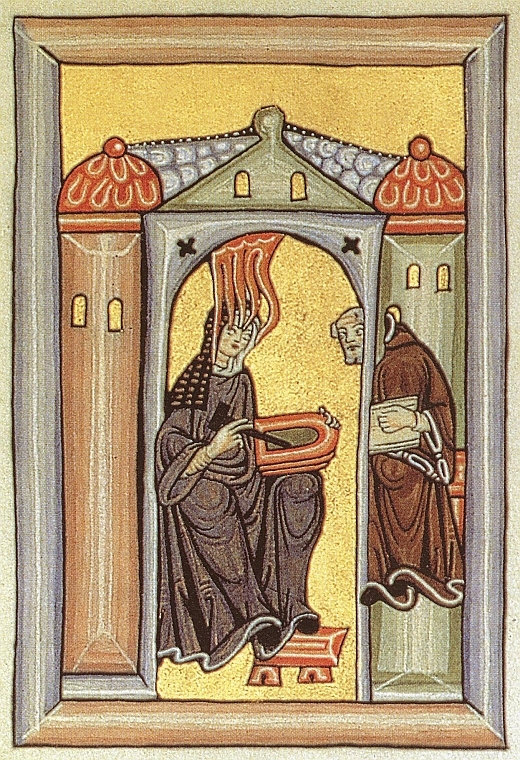 There has been a resurgence of interest in the figure of Hildegard of Bingen, particularly in female religious circles. But despite increased knowledge of her ecstatic religious visions and contribution to medieval music, few are aware that Hildegard also wrote extensively on the subjects of medicine and natural science. These ‘scientific’ works are amongst the most remarkable and original of her writings, providing fascinating insight not only into the thought of the Middle Ages, but into the mind of an extraordinary and highly original woman. Born in 1098 to a noble German family, Hildegard appears to have had little formal education and so, as an unlearned woman, and enclosed nun, she was an unlikely candidate for the roles of writer and preacher that she assumed. It was unheard of for women to write theological treatises, let alone for men to take them seriously, but in 1147-8, her incomplete manuscript was read out approvingly by Pope Eugenius III, and Bernard of Clairveaux gave her his backing. Although her scientific ideas are found throughout her visionary writings, Hildegard also wrote two lesser known works devoted solely to issues of medicine, physiology and what may loosely be termed ‘science’. These were Physica, or the Book of Simple Medicine, and Causae et curae, or the Book of Compound Medicine. Her scientific writings are in some respects quite different from her other works. Where her more theological writings are presented as direct revelation, her two books of scientific writing make no such claims. During the medieval period however there was no category of ‘science’ – theories about the human body, the cosmos and man’s place in the universe incorporated ideas from theology, magic, and natural philosophy. It may be then that the books’ subject matter, the ‘secrets of God,’ allowed them to be bracketed with more overtly prophetic writings. There are certainly hints of the supernatural and religious in Hildegard’s scientific writings. Alongside many practical remedies in both books are prayers or charms, and Hildegard admits that if God withholds his aid, remedies cannot cure the patient. Added to this are hints of sympathetic magic in her remedies and assessments of the various plants, animals, gemstones and metals. Hildegard is particularly notable for her idea that qualities like viriditas, or ‘green energy’, could be transferred from objects into the people that ate, touched or applied them. In one instance, she warns against using the leaves of the walnut tree once the nut has begun to grow. She believed that once the nut began to ripen, the succus, or ‘vital fluid’ would be diverted to its growth, diminishing the efficacy of the leaves. Instead, the leaves used in her remedies should be picked in spring when they were “like young girls before they have borne children.” This principle of sympathetic transference could also apply to character and disposition – Hildegard warns against eating the raven, lest his crafty and thieving nature be imbibed with his meat. In much of this, Hildegard is simply a woman of her time. There are however two major ways in which her work is remarkably original: her adapted theory of humours, and her view of female sexuality. The first of these is absolutely central to her scientific work, defining her whole approach to medicine and physiology. The fundamental theory underpinning both Hildegard’s works is an interesting fusion of classical and Christian thought. In the first place, she bases her understanding of illness on the premise that there are four elements –fire, air, water and earth – which correspond to four qualities – hot, dry, moist and cold. There were also four corresponding humours in the body – choler, blood, phlegm and melancholy, or black bile. An imbalance of these inside the body could lead to illness. This ancient philosophical idea is married with the Christian notion that the earth and everything in it was put there by God to be of service to Man. There was little, according to Hildegard that could not be of medicinal use – all had God-given elemental properties that could be used to cancel out the effects of humoural imbalance. Thus in Physica, Hildegard advises that the ‘dryness’ of quince made it suitable for use as a poultice to draw out the ‘damp’ of an ulcer. Although Hildegard was clearly influenced by the traditional system, she also thought outside it to create her own theory of the human body. Hildegard was by no means a proto-feminist; she writes with the internalised sexism one expects in a woman of the twelfth century. The mix of tradition and innovation is in itself an interesting element of her work and when reading her writings, one is presented at once with the theories of a highly exceptional and innovative woman, and with a small window in time, shedding fascinating light on the intellectual and religious world of the twelfth century as it impacted on one German noblewoman.